Bolay Winter Park Grand Opening Day!!! Name: Bolay Winter Park Grand Opening Day!!! 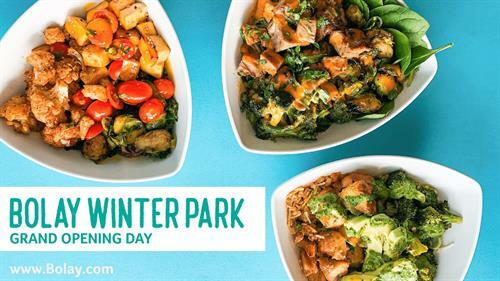 Get ready to celebrate for Bolay Winter Park's Grand Opening! Meet the team that makes it all happen, and enjoy our bold, fresh flavors for purchase. Below is a list of all our awesome Grand Opening Day giveaways, we can't wait to see you there! Watch our Bolay Instagram Story to find 10 plush pineapples we will hide around town! We will post clues on story, and if you find one, you win a Bolay Catering Party for 10 - guest must bring pineapple in to redeem and purchase a bol of $8.29 value or more! You could win one of these items! Every 50th Guest in line will receive a prize after their purchase of $8.29 or more! • A $5 Bolay Gift Card to use towards your next purchase! Delicious coffee from Foxtail Coffee will be served for all guests waiting in line from 10:00am - 1:00pm! We can't wait to see you there!